Superabrasives is a material that is used as a substrate to make various machining products. It can be used in the form of grits, powders, and course particles; or as substrate to bind tools. The superabrasives market encompasses products that are used to shape surfaces in order to customize and design hard-to-grind materials. These products include tools, wear parts, and work piece materials. Superabrasives material include diamond, cubic boron nitride, and others (including wire dies). Wire dies are used in mechanical processing and ultra-precision machining of non-ferrous wires such as bronze, aluminum, nickel, stainless steel, and other alloy wires. Diamond in the form of synthetic diamond is used as a superabrasives material. Synthetic diamond is primarily manufactured by processing diamond powder or graphite through high pressure, high temperature (HPHT) technology. This technology is also used to manufacture cubic boron nitride. Synthetic diamond is used for grinding of non-ferrous materials such as cemented carbide, glass, ceramics, and fiberglass. Cubic boron nitride is used in grinding ferrous materials such as steel, hardened carbon steel, nickel and its alloys, alloy steel, and other ferrous materials. Superabrasives are primarily used for drilling, grinding, polishing, lapping, and honing of surface for high profile accuracy and surface quality. They provide high surface quality and higher grinding efficiency for grinding of hard surfaces, which cannot be polished or grinded by conventional abrasives such as aluminum oxide and tungsten carbide. The purchasing power of people has increased due to the rise in per capita income. This is driving the global demand for vehicles. Additionally, the process of vehicle restoration has increased owing to the growth in number of road accidents across the globe. This increase in vehicle restoration process is fueling the global superabrasives market. Superabrasives are also used for better finishing of surfaces in the automotive sector, due to the increase in demand for electric and fuel-efficient vehicles. Superabrasives are also employed for the development and manufacture of engine shafts. Some manufacturers make hollow shafts instead of solid camshafts. In hollow shafts, the cam lobes are mounted, and superabrasives wheel are used for grinding cam lobes. Key players profiled in the global superabrasives market include Element Six (UK) Limited, Henan Huanghe Whirlwind Co., Ltd., ILJIN DIAMOND CO., LTD , Saint-Gobain S.A., SHOWA DENKO K.K., Hyperion Materials & Technologies, and Zhengzhou ZZDM SUPERABRASIVES CO., LTD. These players engage in collaborations, mergers & acquisitions (M&A), geographical expansion, and launch of new products. In June 2018, Element Six invested US$ 95 Mn in a CVD diamond plant to produce lab-grown diamonds at Oregon, the U.S. The facility is expected provide the company an edge over other players through new product development. Diamond, a form of carbon, is known as the hardest mineral. It is used in jewelry and industrial applications, such as cutting concrete & stone, grinding wheels for machinery, car body work, and high precision grinding equipment, due to its cubic crystalline structure. Synthetic diamond is manufactured using high-pressure high-temperature (HPHT) and chemical vapor deposition (CVD) formation methods. Cubic boron nitride is known to be the second hardest mineral, which is man-made. These are extensively employed in grinding of ferrous metals such as steel and nickel alloys, splitters for space applications, and laser windows for high-power carbon dioxide lasers. Superabrasives offer low and controlled wear rates and lesser wheel change than conventional abrasives. The cubic boron nitride segment is expected to expand rapidly in the near future, due to its higher thermal stability than diamond. In terms of end-user, the automotive segment is projected to hold dominant share of the global superabrasives market during the forecast period. The segment is likely to expand at significant pace from 2018 to 2026. Superabrasives are employed in the manufacture of alloy wheels, cylinder blocks, cam and crank shaft casing machining, and reamed gearbox housings. Additionally, they are also employed in finishing and polishing of ceramic metal-based matrix composite disc brakes. This is anticipated to boost the demand for superabrasives in the next few years. 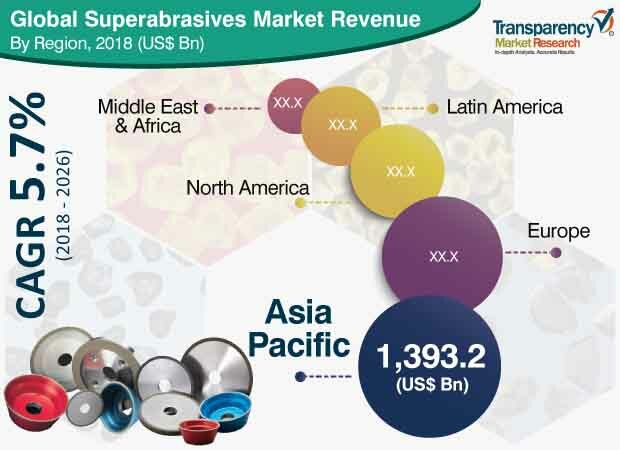 In terms of revenue, Asia Pacific dominates the superabrasives market, owing to the rise in demand for vehicles across the globe. This rise can be ascribed to the growth in per capita income and increase in purchasing power of people in emerging economies in countries such as China and India. Additionally, superabrasives are extensively employed in finishing applications. They are used to coat the cutting edge of saws, which are employed to cut cement in highway construction and repair work. Furthermore, rise in activities such as rebuilding, refurbishing, and renovation of old buildings has augmented investments in the building & construction industry, thereby fuelling the demand for superabrasives. Asia Pacific is a prominent region of the market, owing to the presence of a well-established industrial base in the region. The report comprises a detailed value chain analysis, which provides a comprehensive view of the global superabrasives market. The Porter’s Five Forces model has also been included to help understand the competitive landscape of the market. The study encompasses market attractiveness analysis, wherein various applications of superabrasives have been benchmarked based on their market size, growth rate, and general attractiveness. The study provides a decisive view of the global superabrasives market by segmenting it in terms of material and end-user. These segments have been analyzed based on the present and future trends. Regional segmentation includes the current and projected demand for superabrasives in North America, Europe, Asia Pacific, Latin America, and Middle East & Africa. Key players operating in the superabrasives market include Element Six (UK) Limited, Henan Huanghe Whirlwind Co., Ltd., ILJIN DIAMOND CO., LTD., Saint-Gobain S.A., SHOWA DENKO K.K., Hyperion Materials & Technologies, Zhengzhou ZZDM SUPERABRASIVES CO., LTD., and Shannon Abrasives. These companies have been profiled in terms of attributes such as company overview, financial overview, business strategies, and recent developments. The report provides size (in terms of value and volume) of the superabrasives market for the base year 2017 and the forecast between 2018 and 2026. Market numbers have been estimated based on materials and end-users of superabrasives. Market size and forecast for each end-user segment have been provided for the global and regional markets.